Raksha Bandhan shares its celebration with Kajari Purnima in the Central India. The states of Madhya Pradesh, Chattisgarh and Uttar Pradesh celebrate Kajari Purnima on the full moon day during the month of Shravana. Generally, this festival falls at the end of the monsoon season and is of great significance to farmers. The festival is a vital celebration for farmers, as it signifies the commencement of the sowing season for wheat and barley. On this day, they especially worship Goddess Bhagwati and pray to her to bless them with bounty of crops during the year. Kajari Purnima is the day for celebration and worships. After Shravana Amavasya, on the Kajari Navami or the ninth day, the preparation for Kajari festival begins. Different rites and rituals are the vital part of the celebration. Ladies who are blessed with a boy child perform these rituals and customs. They continue to offer prayers and pujas until the Kajri Purnima day or the full moon day. Going to the field on the day of Shravana Shukla Navami is the major activity of most of the ladies. They bring soil in leaf cups. Barley is sown in this soil and kept in a dark room. The walls of this special darkened room are cleaned with cow dung and mud. And the place where it will be placed is decorated with rice patterns and designs. The mandatory figures of the design include that of a house, a child in cradle, a mongoose and a woman with a pitcher. And the leaf cup is finally placed there. The leaf cup with barley and soil is worshipped for yet another seven days until the full moon day. On the Kajari Purnima day, the grand puja is performed. 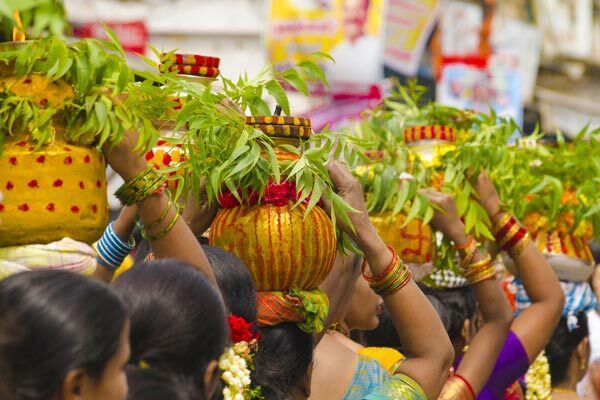 All the women move out in procession carrying the leaf cups on their heads. And carry it to a pond or any other riverside and immerse it with great care and worship. Finally, they keep fast the whole day and pray for the well being of their sons. sendrakhi.com offers you interesting information on Kajari Purnima. Get more information at the website. So, keep browsing!